Jaguar and Land Rover reveal future tech secrets | What Car? 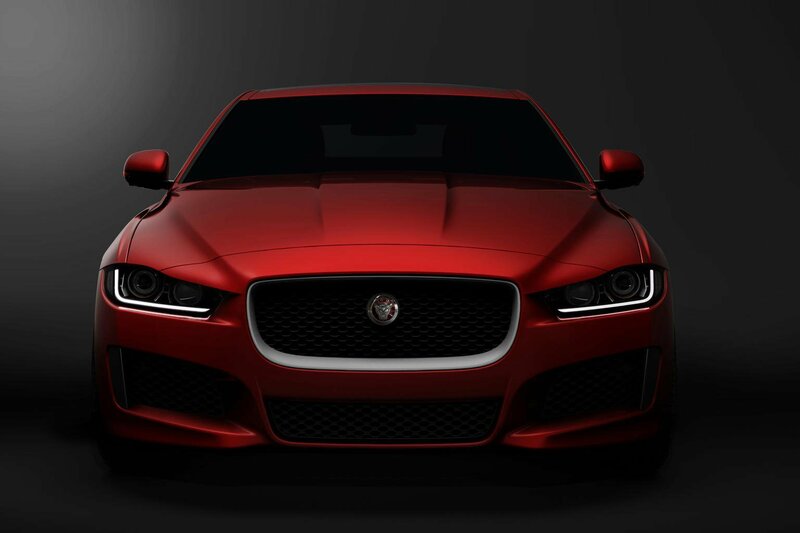 The Jaguar XE will be launched next spring as a rival to the Audi A4, BMW 3 Series and Mercedes C-class. Uniquely for the class, its body structure will be all-aluminium, and power will come from a new family of engines - named Ingenium - that have been designed and built in-house by Jaguar Land Rover for the first time, and which company insiders describe as 'class-leading'. The hope is that these ground-breaking technologies will help take Jaguar from being a car company that sells 75,000 cars a year to more than double that figure in less than 12 months. It is planned that the technology will benefit far more vehicles than the Jaguar XE - with the Ingenium engines set to make their way into a raft of Jaguar and Land Rover products once production at the all-new £500m production plant in Wolverhampton is up and running. It is also hoped that the technical leadership that Jaguar and Land Rover show in aluminium and engine technology can kick-start launches of other cutting-edge technologies that the company is planning for the longer-term future. Below, we select some of the highlights. Production of the new Ingenium engine family will begin with a 2.0-litre diesel, which engineers say will be tuneable to deliver economy of more than 70mpg and emissions below 100g/km when the Jaguar XE goes on sale next year. In addition, it has been confirmed that all Ingenium engines - both petrol and diesel - will get a turbocharger (or sequential turbos), direct injection, stop-start and variable valve timing, in order to chase best-in-class refinement, power and torque, as well as efficiency. Crucially, each Ingenium engine will launched will also be up to 80kg lighter than its current equivalent, with the weight benefits also contributing to a raft of benefits, from allowing superior economy through to improved handling. A system has been developed that uses algorithms to learn common driver behaviour and then pre-set prefered options on journeys. This could include detecting who is driving the car as they get in and setting the steering wheel and seat position, preferred temperature controls and giving traffic information on most commonly taken routes. It could also link to the driver’s phone, and send reminders, telling them when to leave in order to arrive at a destination on time. This technology is likely at least three years from production, but allows information such as speeds and navigation data through to ideal racing lines and virtual race cars to be projected on to the windscreen. At its simplest, this is an extension of current heads-up display technology, which allows a driver to see crucial information without having to take their eyes off the road. At its most extreme, it could be used on a race track to train drivers and help them see where rivals are travelling quicker. The concept also works in tandem with Land Rover’s invisible bonnet technology, which was showcased earlier this year on the Land Rover Discovery Sport concept. It uses state-of-the-art video equipment to record the terrain ahead, and project what’s under the car’s wheels on to the bonnet so the driver always knows what terrain is under the car’s wheels. In order to do away with more buttons, and help keep a driver’s eyes on the road, Jaguar Land Rover is experimenting with gesture control as a means of operating certain functions of the car. The test vehicle they are using has a sensor mounted above the driver’s head, where the controls for a sunroof would traditionally be. Instead of pushing buttons, though, a driver could wave their hand in different directions to open and close the blind or sunroof. Such technology could be extended to setting directions on the sat-nav, or opening windows, as the company bids to reduce the button count in its cars. Using cameras in the instrument binnacle or steering column to track a driver’s head and eyes, the software adjusts the image to create a 3D effect in the instrument cluster without the need for the user to wear 3D glasses. The effect raises the possibility of reversing cameras, for instance, showing 3D images that give drivers a greater depth of field in what they see. Engineers are investigating a multitude of uses for lasers within the next three to five years, from replacing traditional headlight clusters entirely, to measuring water depth before driving in to it, to projecting lines ahead of the car to show its width when negotiating tight spaces, or projecting arrows on to the road surface when a car is indicating to move lanes.